Every Student Succeeds. 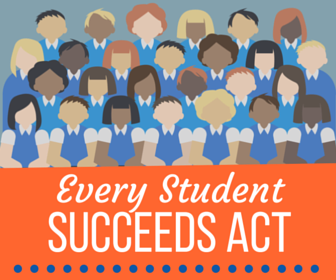 It’s a lofty goal and that’s part of what’s behind the Every Student Succeeds Act (ESSA). But let’s start with the first stumbling block: what does it mean for a child to succeed? That is, what is success? I’m not trying to be philosophically difficult here. I’m really not. We know, we know, that what constitutes success for one individual does not constitute success for another. With all of our emphasis on differentiation and personalization, we know, we know, that not every student learns the same way, has the same passions and interests and abilities, has the same drive. So why, WHY do we insist on trying to measure students’ learning and success by a standardized test? NCLB initiated a quick march to pacing guides and uniform practices. We all had to be on page 72 by Tuesday, or else. In theory, ESSA intends to “break the old all-or-nothing cycle of centralization or decentralization” observes Michael V. McGill in “Making the Most of ESSA” in the March 9, 2016 issue of Education Week. He further notes that Washington has to promote equity and provide resources beyond states’ capacities and that “they” must foster a dialogue. Yes, well, maybe. I’m guessing “they” represents the Department of Education, but, in my opinion, the DOE is far too removed from understanding what equity and appropriate resources look like in most cities, towns, and villages in the United States. What works in some parts of Houston won’t work in others. What works in Wichita, KS won’t work in Hiawatha, KS. What works in some parts of CPS won’t work in others. Not so much “won’t” work, but won’t be the best solution. In other words, what promotes equity and satisfies resource needs in one school in one part of any place may not be the same solution for any other school. And that makes the jobs of local and state education officials and administrators even more complex. As McGill also notes, “This dialogue must start with the understanding that there is no single education problem in America. What works depends heavily on what is at the local level. . . The very policies will enhance the distinctiveness and originality of every school and its surrounding communities.” While the DOE might be able to help facilitate a conversation, I’m not convinced they will help in too many ways. What is good about the ESSA is the amount of latitude it gives states to meet their respective educational needs. 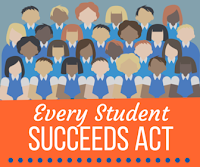 What’s bad about the ESSA is the same thing if the thinking and the actions at the state level do not change. The education officials at the state level need to recognize the potential gift in the ESSA and take a giant step back. What I think needs to happen starting now is this. State education officials need to encourage local school boards and school administrators to do conduct a no-holds-barred audit of all of their initiatives. They need to be ruthless, even with any administrators pet project. With a clear-cut rubric (I have one), they need to assess if an initiative has been implemented with any fidelity and if it is making or has made any difference. If not, it goes. It should go without saying that classroom teachers need to be represented on this audit team as they’re the ones who have to implement every scheme and initiative. This kind of an audit should be conducting at the end of every school year because just as there is such a thing as project creep, there is such a thing as initiative creep. Stuff just keeps getting added without thinking through unintended consequences. Every school has a binder of policies and processes and I have no doubt that some of them conflict. A different team of administrators and teachers needs to review all of the policies and processes with a powerful magnifying glass and make recommendations that benefit the entire school and with a view towards the next two or three years. This audit should be conducted every two years, at least. Get the IT “team,” the media specialist, and some teachers who like to use technology and want to use technology on this team to take a close and objective look at what the school has and what the school needs for the upcoming school year and with a view towards the next two or three years. Is the infrastructure sufficient? Does this team have any recommendations for the Policies and Processes Audit team? What kind of funding is needed to upgrade technology? What kind of funding is needed to get any additional necessary technology? What kind of funding is needed to get any additional technology that would help students succeed at another level? The technology audit should be completed at the end of every school year. If nothing else, it helps provide insight into loss and breakage trends but can also provide insight into usage trends. If there aren’t many community partnerships, figure out why not. These partnerships can include local businesses as well as local community colleges and universities. Building these partnerships benefits teachers and students. Perhaps there will be opportunities for internships or apprenticeships. Perhaps there will be opportunities for guest lecturers, from businesses or from colleges and universities. Perhaps there will be opportunities for dual credit, for extended learning the school can’t offer, for scholarships. This should be on-going. I’d have an assistant principal and a couple of teachers, maybe not the “obvious” choices, as part of the team that meets quarterly to do a status check on the community partnerships and see what else they could be doing to retain and build partnerships. By the way, not all partnerships have to be immediately local. And, these partnerships may help contribute to finding a way to some degree of equity. We have become content to rely on governments to provide for us, but schools need to take some control over their own futures. They need to be able to articulate their needs clearly and specifically. The state officials need to be able to facilitate and coordinate cooperation locally and federally; that’s no small task if local and state agencies are honestly going to try to meet the needs of individual schools. At the end of the day, it’s not about federal, state, or local governments. It’s not about local school boards or teachers’ unions. It’s not about PTOs. It’s about the kids. It’s always about the kids. Or should be. Some of our kids have a lot of obstacles to overcome. Some of our kids have different, less obvious obstacles to overcome. The solutions for our high-poverty schools are different from the high-achieving and often wealthier schools. As we think about what it means for every kid to succeed, let’s not try to apply a single solution or set of policies or assessment method or funding calculus to our schools. Let’s do the very hard work of individualizing what it means to provide equity and resources to our schools, and enabling our teachers to do what they do best: focus on the kids.